GoPro continues to release new and better Hero action cameras each year, and they get better picture quality and more and more new features – the latest GoPro HERO4 Black edition for example, however the price also increases with that. You also need to buy additional extra accessories such as various mounts and other accessories in order to make the best of your GoPro action camera. It is good that most of the accessories are backwards compatible and the more specific ones are compatible with the latest generation of GoPro HERO4 as well as with the previous GoPro HERO3+ and HERO3 cameras. 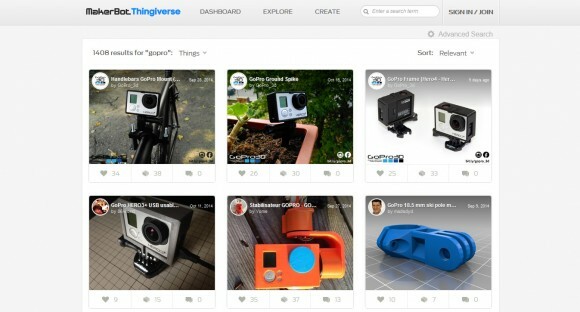 If you have a 3D printer however you are already able to 3D print many of the accessories and mounts being sold by GoPro yourself and there are also quite a few others that you cannot actually buy. The user community that uses both 3D printers and GoPro action cameras is actually quite big and there are already a lot of contributed designs for various camera mounts and accessories that you can print yourself. There is no need to design something, the 3D models ready for printing are already available for free, and should you need something more specific that is not yet available you can use some of the readily available mounts or accessories and modify them to better suit your needs. This all saves a lot of time and actually the 3D printed mounts and accessories for GoPro action cameras can turn out to be not only significantly cheaper, but also better in some ways as you are able to use various printing settings and materials. So why not give it a try the next time you need something for your GoPro HERO action camera, just print it and test, we have done so and are really happy with the results we are getting.